Happy New year my people! It was a quiet holiday for us. And as we come out of the holiday season, I have been cleaning, doing lundry and making sure everyone in my household has what they need. As a woman and a mother, I know that even while trying to make sure that my ajebutters fulfill their dreams and ambitions; I must not lose myself. And while I was trying to have a chill New year’s day with my ajebutters, this recipe came to mind. Traditionally, I do not cook on New year’s day, but I honestly had not made anything the night before. All we had was a pack of cookies and a tin of hot cocoa, so I decided to make the kids happy by frying some plantain and yam. I know yes, plantains and yam but honestly it was epic for the kids. Ordinarily they would not eat yam except made certain ways with a whole lot of flavor, but they enjoyed the one I made. Maybe it was because I had soaked the yam in salty cold water before frying. 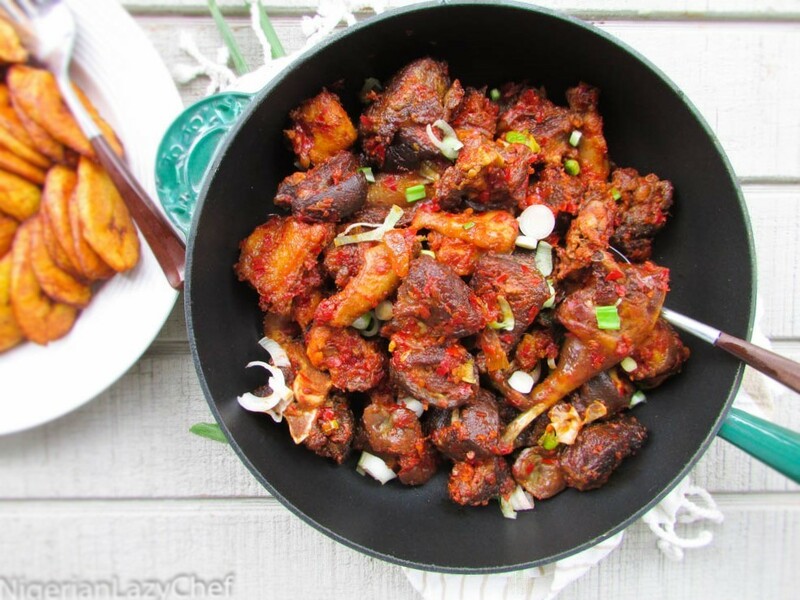 As for the plantain a.k.a dodo, it is always a favorite of ours. We can eat dodo for Africa! Peppered meats are a huge staple and not only in some Nigerian homes, but in Nigerian parties. There is no party without peppered meats as a finger food or appetizer(yes we dey chop meat as appetizer 🙂 ). It goes great with puffies i.e. puffpuff and plantain puffs. But for me, I had mine as a meal with fried yam and plantains. 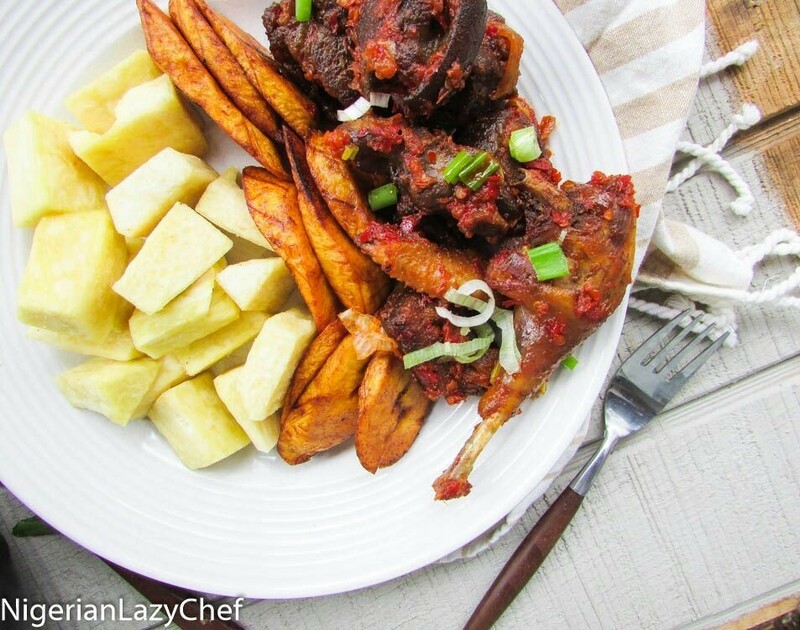 The sauce can be used to eat yam, or plantain and even akara i.e. fried bean fritters. If you are Nigerian you know what I mean (nostalgia). Even as I write, I have worked up an appetite for some easy peppered meats drenched in atadindin; with yam and plantain as a side, I am also thinking of puffies for my tired bones. Roughly blend the tomatoes,atarodo and half of the onion. Pour the mix into a pot to boil out the water until you have a thick paste. Alternatively, pour the mix through a fine mesh sieve to drain out the water. Cut the meat into bite sizes and place into a pot. Season with salt, dry pepper, one garlic clove, bouillon and drop in the bay leaves. Do not add water. Let it cook in it's own juices until it comes to a boil and has almost dried out. Pour in some water to the level of the meats and check for seasonings. Once the meat is tender, drain the meat from the meat stock and deep fry or grill in a 350 degree oven until golden brown. 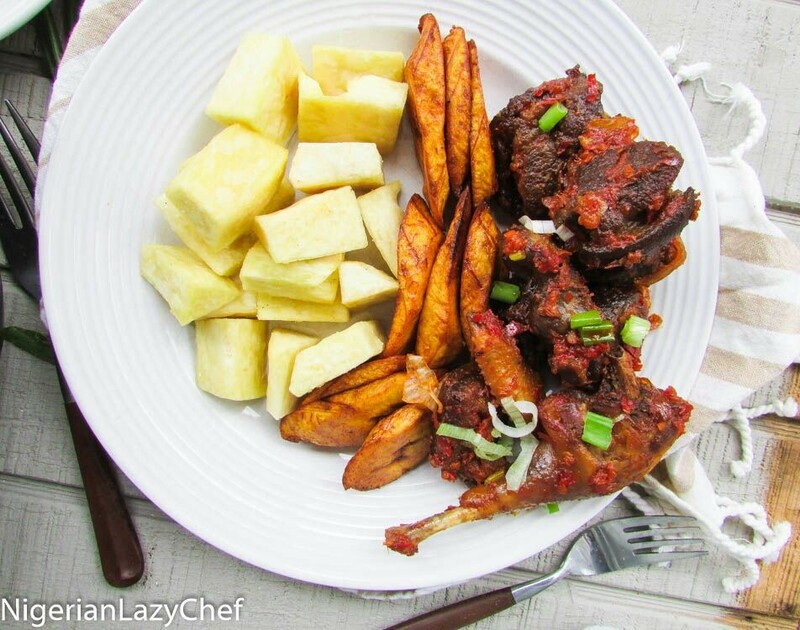 This entry was posted in Appetizers, healthy holiday recipes, Holiday recipes, Meat dishes, peppered beef, Peppered meats, Protein Dishes, Sauces, Small chops, Uncategorized and tagged assorted meats, Nigerian food blog, Nigerian peppered meats, Nigerian small chops, Owambe, peppered meats. Is there a recipe for the pepper sauce that’s mentioned in the ingredients? If so, may you please let me know. Great recipe! Do you add crayfish powder?